Residents of a devastated Quebec town are seeking compensation for victims of the disaster, which killed 50 people. 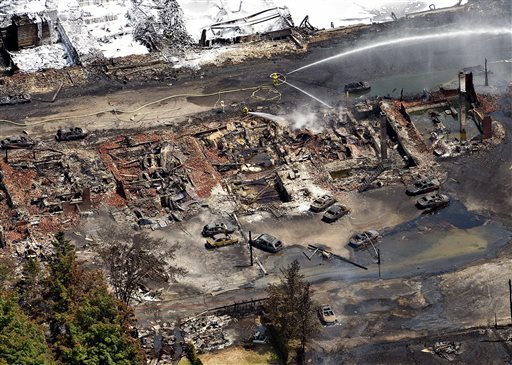 Two residents of Lac-Megantic, Quebec, where a runaway train derailed and caused an explosion and fire that killed 50 people, have initiated a class-action lawsuit seeking compensation for victims of the disaster. Yannick Gagne and Guy Ouellet would seek damages from the Maine-based Montreal Maine & Atlantic Railway, Irving Oil and the company that extracted the crude oil the train was carrying. No dollar figures are in the lawsuit, but it could be among the largest claims ever filed in Canada, said an attorney in the case. 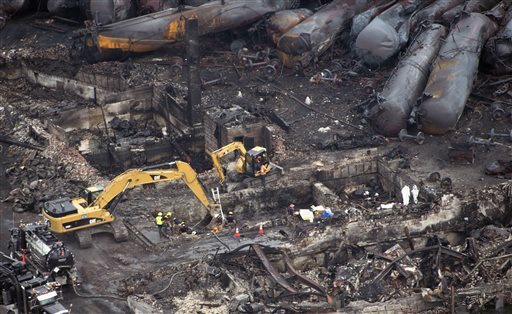 Before dawn on July 6, an unattended Montreal Maine & Atlantic train carrying 72 oil tanker cars rolled downhill into Lac-Megantic and crashed, causing an explosion that leveled much of the town’s center. Ouellet lost his partner, Diane Bizier. Gagne owns the Musi-Cafe, a bar that was crowded with people when it was destroyed by the blast. The plaintiffs filed a motion Monday in Quebec Superior Court seeking to authorize a class-action suit against the railway company. On Wednesday, the plaintiffs amended the motion to add as defendants Irving Oil, World Fuel Services and its subsidiary Dakota Plains Holdings. Dakota Plains Holdings extracted the oil that was being carried east by the train to an Irving Oil refinery in Saint John, New Brunswick. The motion claims that the companies failed to ensure the oil was properly secured and safely transported. The lawsuit would seek compensation for any person or business affected directly or indirectly by the disaster. It was not known Thursday when the court will rule on the motion. Three law firms are working on the case. Jeff Orenstein of Consumer Law Group Inc. in Montreal, one of the firms, said the claim could be among the largest ever filed in Canada. 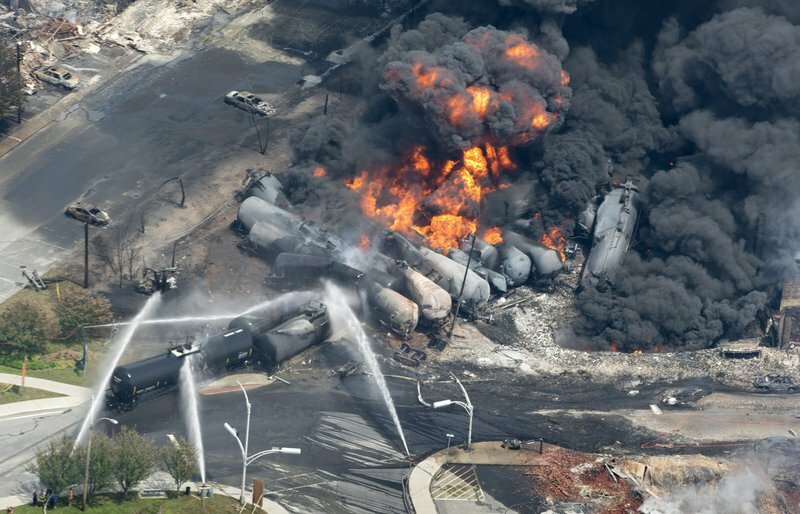 Orenstein told Postmedia News that the disaster affected everyone in Lac-Megantic, a town of 6,000 residents just 10 miles from Maine’s western border. Canadian courts typically set a lower bar for certification of class-action lawsuits than U.S. courts. But the awards, including punitive damages, are much lower in Canada, according to an analysis by McCarthy Tetrault, a large Canadian law firm. Laurence Leavitt, a trial lawyer in Yarmouth, Maine, who usually represents defendants in cases involving explosions, said it’s clear from news accounts that the disaster occurred when an unattended, parked train was not adequately secured. The railroad’s chairman, Edward Burkhardt, apologized to the residents of Lac-Megantic last week. He said the engineer who parked the train in a nearby town uphill from Lac-Megantic likely failed to set sufficient hand brakes. The lawsuit quotes a statement that Burkhardt made during an impromptu news conference in the town on July 10, after a reporter asked him if he accepted full responsibility for the disaster. It makes sense for the plaintiffs to add Irving Oil to the lawsuit because it has “much deeper pockets” than the railroad, said Chalmers “Chop” Hardenbergh of Freeport, who publishes Atlantic Northeast Rails & Ports, a trade publication. He said he wonders how long the cash-strapped Montreal, Maine & Atlantic Railway can survive before it files for bankruptcy. The company is based in Hermon, outside Bangor. Because Canadian authorities consider the disaster area a crime scene, the railroad has been unable to repair the track. As a result, its lines in Maine have been severed from its lines in Quebec and Vermont, and the company has lost much of its freight business. On Tuesday, the company laid off 79 of its 179 employees, with its work force in Maine bearing 60 of the layoffs. Hardenbergh said Montreal, Maine & Atlantic will go bankrupt if it is not allowed to fix its rails and resume its normal freight business. He said the railroad would probably run out of money in a matter of weeks. Hardenbergh said Burkhardt will likely try to sell the railroad before it goes bankrupt to keep the business intact. He said it’s complicated to sell a railroad after a bankruptcy case is filed. The most likely buyer, he said, is Irving Oil. Irving owns the Eastern Maine Railway Co., which connects with the Montreal, Maine & Atlantic Railway at Brownville Junction in Maine. 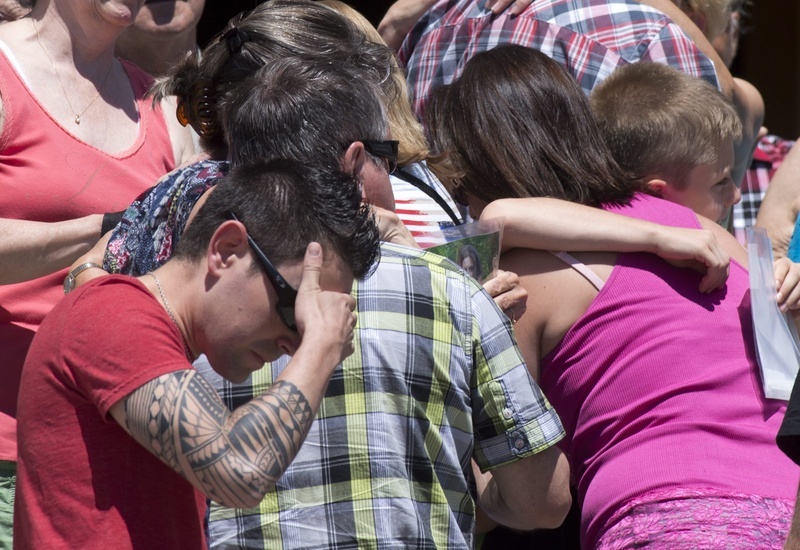 A spokeswoman for Irving Oil told The Associated Press that the company sent personnel to the crash site and provided firefighting foam within hours of the disaster. “We did not own or control the crude oil or its transportation at any time,” Carolyn Van der Veen said in an email. Officials at World Fuel Services and Dakota Plains didn’t return messages seeking comment Thursday.